In digital photography - since it ever started that affordable camera bodies entered the amateur stage - technical innovation sped up comparably to the Personal Computer success many years before. Camera suppliers competed on a yearly base or less with continous updates, new features, better image quality and - it seemed most important of all - larger pixel resolutions. 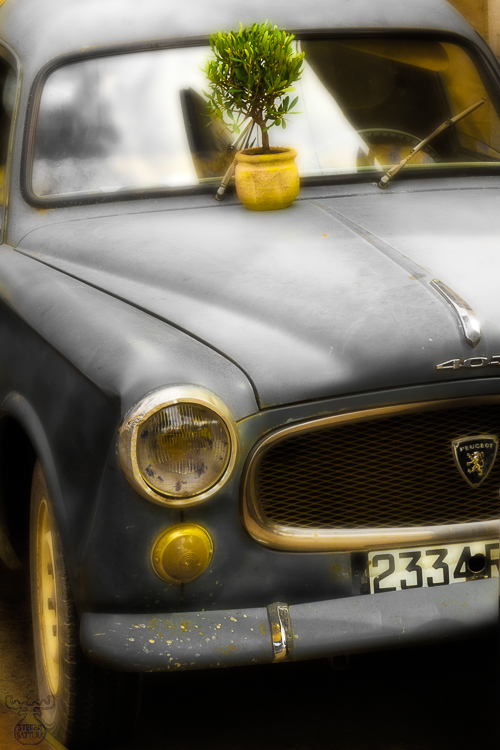 These and some more thoughts came into my mind when strolling through the exciting weekly market in Saint-Rémy-de-Provence when I saw this Peugeot oldtimer. In Germany this kind of car most likely would either be found abandoned in an old barn or - perfectly restored - exhibited at an oldtimer show. Here it was in the middle of the market - the car of a marketer, who still used it to transport him and his goods - maybe for eons already. The well used car still fulfilled it's purpose and served his master despite the fact, that it had likely less horsepower and was slower while consuming three times the fuel than any modern car. Generations lied in between this relict and the modern energy saving hybrid high speed luxury SUVs shown in the glossiest brochures of the car dealer nearby. It was not worse for the owner than those though. The small plant as a little decoration on the car hood was not for sale actually. Maybe the marketer used it as a kind of "cuddle toy" for his trusted partner- the Peugeot - while he was busy.